Nechtěl bych jít někam ven, neboť jít není už zahálet; ani číst, ani spát, protože ani to, ani ono není zahálka; ani se bavit, ani odpočívat, protože zahálka není ani odpočinek, ani zábava. Zahálka, čistá, dokonalá zahálka není ani kratochvíle, ani dlouhá chvíle; zahálka, toť něco negativního: je to nepřítomnost všeho, co člověka zaměstnává, zabavuje, rozptyluje, zajímá, zaneprázdňuje, trápí, těší, váže, vyžaduje, baví, nudí, okouzluje, otravuje, zabírá nebo zaneřáďuje; je to nic, zápor, neúčel, bezcíl, nevím už jak to říci; zkrátka něco dokonalého a vzácného. Klid, toť pomalu a stále plynoucí proud, jenž tiše šplouná a zkolébává; odpočinek, to jest temná a pokojná tůně, na níž odplývá rmut a pěna zlých nebo prudkých chvil; lenošení, toť zátoka pokrytá zelenou řasou, slizem a žabími vajíčky; ale zahálka jest utkvění. Nemá rytmu ani zvuku; stojí, nepostupuje. Nedává život plevelu, ani řase, ani komáru. Voda mrtvá a průhledná. Byť stojí, nezahřeje se. Stojí a neobrůstá. Nemá směru, ani obsahu, ani chuti. Chtěl bych dnes zahálet; ne, chce se mi nechtít nic. Chce se mi – čeho vlastně? Ničeho; neboť to právě jest zahálka. Být jako kámen, ale bez tíhy. Být jako voda, ale bez zrcadlení. Jak oblak, ale bez pohybu. Být jako zvíře, ale bez hladu. Být jako člověk, ale bez myšlenky. Dívat se na bílý papír, prázdný a hladký; nepsat a dívat se, až by se (z vlastní iniciativy) pokryl černými písmenky, slovy, větami, řádky odshora dolů: první list, druhý a třetí; a pak, pak to nemuset číst, pak to s ohromnou samozřejmostí pravé, hluboké zahálky vůbec nepřečíst a obrátit oči k první jarní mouše, která leze po okně, dívat se na ni a nevidět jí; a pak – nu, což zahálka potřebuje nějakého programu? Neboť vždy lze nalézt něco k nedělání, k nevidění a k nesledování. ‘Deiryu…Deiryu…Deiryu…’, the thunderous voice of the Zen Buddhist master Yamamoto Gempo (1866-1961) called out as tears flowed down his face. Gempo was conducting the funeral service for Kanshu Sojun, better known as Deiryu, on the morning of 7 March 1954 at the temple Empukuji, just outside Kyoto. Deiryu had been only sixty when he died, and the deep sorrow and affection expressed by Gempo, himself 89 years old, was indicative of the love felt for Deiryu by monks and lay people alike. Deiryu was born in 1895 to the lzawa family. Although the Izawas were residents of Kobe, he was actually born in Tomogashima in Wakayama prefecture, where Deiryu’s father was working as an engineer on the construction of a fort. The elder Izawa was a noted naval engineer, and Deiryu received the strict upbringing and education typically given a son in a military family. One of his brothers, in fact, joined the navy, eventually becoming a Rear Admiral, and following further in his father’s footsteps, acted as it consultant on the construction of a lighthouse. Deiryu held military men in great respect throughout his life, but his father’s expectations were overwhelming, and school in particular made Deiryu agitated and nervous. He found a remedy for his academic troubles in physical education, an area in which he was said to have excelled. He had a particular affinity for the sea, and since he outclassed the other students in swimming, he often represented his school in competitions. Despite his athletic abilities, Deiryu was diagnosed with pulmonary tuberculosis, and his doctors predicted he would not live past the age of 25. Faced with an uncertain future, he decided to begin serving as an acolyte in a Zen temple. However, times were difficult, and many temples were experiencing severe financial hardship. The local temple, Zensho-ji, already had five acolytes, and due to its destitute state could not afford another. Hearing of Deiryu’s predicament, the Zen master Nantenbo (Toju Zenchu: 1839-1925) from Kaisei-ji (in Nishinomiya, between Osaka and Kobe) stepped in, saying: ‘Kaisei-ji right now also has many troubles, but by all means I will allow this child to become an acolyte’. Thus, Deiryu began serving as an attendant to Nantenbo, one of the most noted and highly respected Zen masters of the twentieth century. Despite occasionally running into trouble for his independent spirit., Nantenbo, more than any other Zen master, helped usher Zen safely into the twentieth century by emphasizing strict, traditional training, and practice in the face of modernization. He was also a noted painter-calligrapher. In the spring of 1912, Deiryu’s father and mother passed away within a month of each other—a great shock that sent Deiryu into a period of deep mourning. Attempting to escape his sorrow through physical activity, he turned to kendo (fencing with bamboo swords), an art in which he was already very accomplished. The kendo master at the gym in Kobe at the time was a friend of Deiryu’s older brother Toru, a man named Takeji Teramoto. Teramoto was acquainted with Nantenbo and often asked the master to talk about Zen to his kendo group. Largely through Teramoto’s influence, in 1913 Deiryu entered Kaisei-ji to train formally as a monk, rather than to be merely an acolyte, under Nantenbo. With Nantenbo, Deiryu traveled through the countryside on lecture tours for the general public, trips that could include as many as thirty stops. The two usually traveled at night, often sitting up in a third-class train carriage, in order to arrive at the next location in the morning. On these journeys, Nantenbo sat in zazen meditation, and Deiryu diligently memorized Zen texts and practiced calligraphy by tracing the shapes of characters with his finger in the palm of his hand. When Deiryu was young, and still called ‘Jun-san’ [the name he had as a novice], he used to practice calligraphy all day when his Master, Nantenbo, was away. He also practiced calligraphy whenever he was on a train or ship with Nantenbo. With an example by Wang Hsi-chih [Wang Xizhi: 309-65] on his lap, he licked the index finger of his right hand and practiced copying the characters on his left palm with it. Once he started, nothing distracted him. the autumn voice is stilled. The poem reveals how both joy and sorrow can be magnified by the changing aspects of nature and the seasons. Just as the presence of plum blossoms can enhance an evening of moon viewing, the absence of bamboo makes autumn a little more austere and lonely. The rhythm and breadth of the characters as they sweep down the scroll, punctuated by streams of ‘flying white’ (where the brush has split, allowing the paper to show through) are reminiscent of Nantenbo’s style of brushwork. Extinguishing the transmission like a blind donkey. Nantenbo is depicted in stem concentration, with fiercely knit brows and scowling mouth. Both the physical and the textual descriptions reveal a Zen master of strong conviction, determined to protect and preserve the true nature of Zen. Deiryu has portrayed his master with awe and slight apprehension; the thick eyebrows and powerful frown enhance the fierceness of a Zen master as seen by his disciple. The inclusion of calligraphic inscriptions on functional objects such as the keisaku reinforces the continuity of art, teaching, training and life in Zen Buddhism. The inscribed objects reveal not only the Zen master’s enlightened experience, but also the tools with which his experience will be transmitted. Personal experience and spiritual tradition merge. Deiryu left Kaisei-ji probably in 1924 and went to Empuku-ji, a major training center for Rinzai Zen, to continue his study under Kozuki Tesso (1883-1941), the master from whom he would receive inka (certification of enlightenment). Unfortunately, the year after Deiryu arrived, Nantenbo became ill, and Deiryu returned to Kaisei-ji to be with him during his last days. In 1927, Deiryu was sent to Taiwan to become head of Rinzai-ji, a branch temple of the Kyoto temple Myoshin-ji. There he promoted the spread of Zen throughout Southeast Asia. Two years later, he became head of Kensho-ji in Kumamoto prefecture, Kyushu, and then in 1932, at the age of 37, he returned to his first temple, Kaisei-ji, as kancho (‘abbot’). During his tenure at Kaisei-ji, he established a private school for students from Southeast Asia at the temple. The establishment of this school required great effort on Deiryu’s part: he received help and support from many friends and acquaintances whom he had met in Taiwan, as well as from his elder brother, who was by that time a naval officer. In 1937, while on a lecture tour, Kozuki Roshi, Zen master at Empuku-ji, was killed in a car accident, and Deiryu was asked to take over his position. Before beginning his duties at the sodo (training hall) at Empuku-ji, Deiryu decided to visit 25 sodo around the country, meeting the Zen masters at each. Having completed this task, he then began what would be a seventeen-year, tenure at Empuku-ji. While overseeing the training program at the temple, Deiryu showed great appreciation for the trials and tribulations of the monks he taught, and he could often be seen on begging rounds with his pupils. Isamu Yoshii, his close friend and a noted poet, described the practice: ‘My house faced the road which led from Empuku-ji to town. Over the hedge, I used to see a group of monks on begging rounds walking down the road chanting “oh, oh” in the morning mist. At the head of the group was Deiryu himself wearing a brown robe, which distinguished him from the other monks in black robes’. For the Zen master of such a large Zen monastery to participate in begging rounds with his student monks was highly unusual. The sight of black-robed monks on their morning begging rounds, their chanting resounding down narrow neighborhood streets, can still be witnessed today in Japan. The visual as well as the aural impression created is striking and has lent itself to one of the most charming and beloved subjects in Zen painting. Although the theme is known to have been painted by Zen monk-artists of the Edo period (1615-1867), such as Kogan Gengei (1747-1821), it was Nantenbo who simplified the compositions into two gentle swaying groups of monks clad in black robes and sedge hats. Influenced by his teacher, Deiryu continued the tradition and painted his own diptychs of monks going out and returning from their rounds, or sometimes, single images showing one line of monks (Figure 4). The visual effect of the simplified ink figures is quite stunning; the black streaks comprising their robes fading into a gentle gray wash as the monks recede. The charmingly simplified feet and the faces that peer out one after another, mouths open to show the monks chanting, also reveal the delightfully uninhibited nature of Zen. Particularly appealing is the final figure in the procession, whose eyes peer demurely over the other monks. The inscription on the scroll reads: ‘Walking, walking this Buddhist path’. The four characters on one of the cups can also be seen inscribed within the enso (‘Zen circle’) in Figure 6. Here Deiryu has written the words, ‘Old pine, cloud leisure’, in bold calligraphy within a circle of gray ink punctuated by a few patches of ‘flying white’. The wash of gray ink gives the enso a sense of radiance, which is enhanced by the sliver of darker ink along the left outer edge of the single brushstroke describing the circle. Are like old man Saio’s [horse]. This is a reference to an ancient Chinese tale that Nantenbo had often utilized in his own paintings, suggesting that worldly gains and losses are meaningless. According to the story, old man Saio’s horse runs away, but the old man is untroubled, suggesting that eventually something good might come of it. A few months later, the horse returns, bringing with it a beautiful stallion, but Saio does not rejoice. Soon afterwards, the old man’s son falls from the horse and breaks his leg. Again Saio simply accepts what has happened. Because of his lame leg, the son cannot be conscripted into the army. Saio’s wisdom is revealed as the sons of his neighbors fail to return from the war. Deiryu is not merely enhancing or illustrating the inscription by adding the image of the horse; rather, the image had been used as a substitute for the word ‘horse’, establishing a unique relationship between text and image. In East Asian art this is particularly appropriate, since many Japanese and Chinese characters were originally derived from pictographs. Deiryu has cleverly placed the horse at the end of the line of calligraphy, thus creating a continuous flow and making no distinction between word and image. Flowers smile; warblers sing by my hermitage. At the pure cool mountaintop, Buddha is bright and vivid. To explain the dream within a dream is a fool’s dream. My experiences have come and gone for 59 years. Trees return to vivid blues and greens. Ironically, at some point in his life, Deiryu created a work in which he boldly wrote the character for ‘dream’, allowing it to fill the composition, and adding nothing else except his signature and seals (Figure 8). The manner in which the brushstrokes dance dramatically over the paper reveals the strength and spontaneity for which Zen calligraphy is noted. However, within the powerful directness of the calligraphic gesture there remains a certain mystery. Despite his seventeen-year tenure at Empuku-ji, Deiryu probably never reached his ultimate potential as a Zen master. Aware of Deiryu’s frail health, Nantenbo had once told him: ‘You should live to fifty, or sixty, but seventy or eighty is full of bloom’. (ibid., p.63) Nonetheless, Deiryu protected and fostered the tradition of monastic Zen training and practice in Japan, making sure that the efforts, which had been made by Nantenbo at the turn of the century, were not in vain. In his painting and calligraphy, Deiryu displayed the humor, strength an inner vision that made him one of the outstanding monk-artists of the twentieth century. Audrey Yoshiko Seo, PhD, teaches Japanese art and culture at the College of William and Mary in Williamsburg, Virginia. She is the author of The Art of Twentieth Century Zen: Paintings and Calligraphy by Japanese Masters (Boston, 1998). The book also serves as the catalogue to the exhibition of the same name, which will travel to five museums in the United States from 1998 to 2000, and which includes eleven works by Deiryu. Each morning at Soto Zen temples throughout Japan and elsewhere as well, it is customary to chant a series of five sutras for the morning service. The third sutra chanted, typically Sandokai or Hokyozanmai, is dedicated “to the successive generations of buddhas and ancestors who transmitted the flame (of the Dharma).” One of the defining characteristics of the Zen school is this transmission of the Dharma from generation to generation. And hence, there is a strong emphasis on tradition*1. Many of the sutras chanted in Japanese Zen monasteries, as well as all of the eko, are still written and recited in classical Chinese, albeit using Japanese phonetics. And this is hundreds of years following the introduction of Zen to Japan. Since the eko are written in classical Chinese order, the grammar of which is completely different than Japanese, a monk is required to spend extra time simply learning how to read the phrases in Japanese order. I remember explaining to a younger American monk what seems to Westerners to be an archaic system and he immediately exclaimed, “But why? !” He couldn’t fathom the reason for maintaining a system that seemed to him completely obsolete, a good example of our very pragmatic American way of thinking. Why not simply write the characters in the order in which they would be read in Japanese? The only answer that came to mind was, “In Zen, there is this great emphasis on tradition.” China was traditionally looked to as the source of culture in other fields as well. So, this one example is by no means unique. It also corresponds to the way the Catholic Church continued to use Latin as the liturgical language even until fairly recently. In Zen, however, it wasn’t only the liturgy. Many of the anecdotes referred to in teaching about Zen are from China and still pronounced in Chinese order. Also, nearly all of the thousands of phrases used by Zen masters for various sorts of calligraphies come from China. This is really quite astounding when we consider that Zen was introduced to Japan nearly 800 years ago. 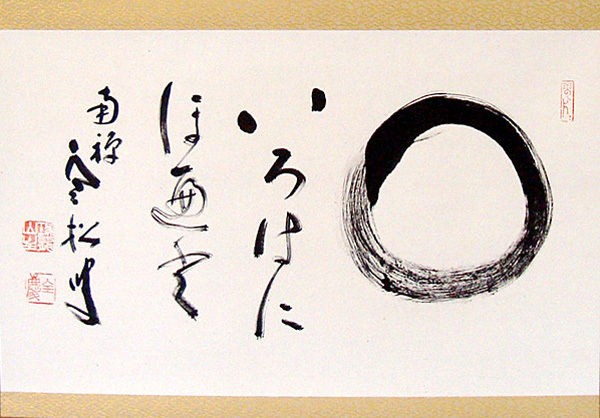 It is easy to see the way language and tradition have been used to authenticate Zen. All of this serves as a lengthy introduction as I reflect on the Dendokyoshi Kenshusho (Workshop) that was held last year at Hosshinji Monastery in Obama City, Fukui Prefecture, Japan. Six European and two American Zen teachers participated in a one-month special ango that comprised this workshop. Over the years, the Administrative Headquarters of Soto Zen Buddhism has convened several of these special study sessions in order to recognize senior Western teachers. The first of them were held in the 1980s at Shuzenji, Daijoji, and Koshoji, three monasteries in Japan, and one was held in the 1990s at Green Gulch Farm. There was a several year hiatus until the one held last hear. Hosshinji Monastery was probably chosen for two main reasons. One was that Harada Sekkei Roshi, abbot and shike of the monastery, had been chosen to be Director of Soto Zen Buddhism Europe Office. Since six Europeans were scheduled to attend the ango, it would provide a way for Harada Roshi and these teachers to get acquainted. Secondly, Hosshinji Monastery is a flourishing monastery in a rural Japanese setting, and since many non-Japanese people have been training there over the years, it would be fairly easy to accommodate these Westerners and at the same time give them a taste of traditional Japanese monastic training. The primary reason for these Dendokyoshi workshops is to give certification to Western Zen teachers who have not, for one reason or another, been able to spend a longer time in a Japanese monastery so that their disciples can be properly registered at the Administrative Headquarters of Soto Zen Buddhism in Tokyo. The actual ango was divided into two two-week sessions, the first in the latter part of May and the second in mid-November. The theme of the workshop was “Transmission of the Dharma.” Harada Roshi was the chief lecturer and first spoke on Zenkaisho, a commentary on a teisho Dogen Zenji gave on the Bommo-kyo, a sutra specifically concerned with the precepts. In total, Roshi gave nearly twenty talks and certainly this was one of the main attractions of the workshop, not only for the guest participants, but also for the people training at Hosshinji. During the course of the workshop, Harada Roshi continued to speak about the transmission of the Dharma (a transmission outside of the teachings), often using cases from the Mumonkan as well as sections of the Gakudoyojinshu to illustrate his points. Participants in the ango were then encouraged to ask questions following the talks or to come to dokusan individually to clarify any uncertain points. Certainly, this was another attractive element of the ango. Other lecturers included Rev. Shohaku Okumura, who lectured on the Eihei Koroku and The Four Practices of a Bodhisattva and Rev. Dosho Saikawa, who lectured on the Shoyoroku. The other main feature of the Dendokyoshi Workshop was to have the guests participate in everyday monastic life. At Hosshinji, we get up at 4:00 a.m. and sit one period of zazen. At 5:00 a.m. the morning sutra service is held in the Dharma Hall. This is followed by breakfast and during the first half of the Workshop, breakfast and lunch were served in the zendo with formal oryoki. Typically, we work from 8:00-10:30 a.m., followed by lunch at 11:00 a.m. However, because many Dharma talks were given, the work period was often cut short. Following a rest period after lunch, we have work from 1:00-4:00 p.m. During the workshop, this work period was also shortened to make time so that the participants could practice the various duties needed to perform the morning and afternoon sutra services. The afternoon sutra service was at 5:00 p.m., followed by dinner at 5:30 p.m. and then a bath. At 7:20 p.m. we sat two more periods of zazen. Outside this regular daily schedule, other activities included takuhatsu (begging) in Obama, which we usually do three times a month at Hosshinji during the ango, and a sightseeing trip to see local temples. Although some Zen centers in the West have incorporated quite a bit of the Japanese monastic form into their training practice, many of the people who took part in last year’s workshop had never used oryoki (at least not the formal style with six bowls used in a Japanese monastery). Several were also not familiar with even the basic movements in the Dharma Hall, not to mention performing all the different duties necessary for the daily sutra services. For myself, I have to say that teaching these basics was the most demanding part of the workshop. Persuading the participants that it was worth their time and effort to seriously undertake learning the various meal forms, the duties for services, as well as keeping up their general appearance in terms of robes, kimono, and so on, and then teaching the forms and doing our best to see that they could carry them out well, took quite a bit of energy. To this end, several staff members of the Administrative Headquarters of Soto Zen Buddhism, as well as monks at Hosshinji, joined in to help make this possible. It really is expecting a great deal for people with little or no experience to come into a new environment and master forms that some, though certainly not all, may perceive to be unnecessary. To this end, one of the most convincing points I was able to make was that all of the activities in the life at Hosshinji are considered to be forms of zazen, that we live within zazen, rather than zazen being one activity which we incorporate into our life. It took me quite a while myself to appreciate this aspect of zazen. When I began practicing at Hosshinji as a young man, I felt quite a bit of resistance toward ceremonial form, and for a long time contently cooked breakfast each morning instead of participating in the morning service. It was only over a period of several years that I came to appreciate the beauty of performing the services in unison with the other monks as another form of zazen. And I think my personal experience was useful in conveying the value of this aspect of monastic form to our guests. For Westerners, one of the most attractive aspects of Buddhism is that is has been so flexible over the centuries. As it has moved from India to China to Korea to Japan and now the West, it has always adapted itself to the new culture rather than trying to change it. And yet at the same time, it has brought about huge transformations to each culture, most likely because rather than trying to suppress native religions, it has incorporated them into the Buddhist teaching. Many Westerners have been eager to claim Zen as their own by emphasizing its universal aspect. At the same time, some people have rejected traditional Japanese Zen because they perceived it as stuck in tradition and no longer relevant. It is here at the juncture of East and West that we can sense the tension between tradition on the one hand and the desire to innovate and be free of tradition on the other. It seems to me that Soto Zen is now at a crossroads. The critical and really the only important issue is the true transmission of the Dharma, regardless of East or West. Certainly, this is a transmission outside the teachings and yet at the same time, it is precisely because of the blood, sweat, and tears of the successive Great Masters that we can now do zazen. This is something we cannot deny or overlook. While many Westerners would like to be confident in their understanding of Zen and confident to experiment with new forms, I also know that at least some Western Zen teachers are concerned that there is still something left to learn from traditional Japanese Zen. For that reason alone, I am sure I speak for everyone at Hosshinji when I say that even though it was a considerable task for us to host last year’s Dendokyoshi workshop, we thought it was a worthwhile effort for everyone involved.